“I have no secrets,” Alexander Bolshunov told FIS in regard to his back-to-back wins in Kuusamo, Finland. On Saturday, the Russian had won a drag race with Norway’s superstar Johannes Hoesflot Klaebo during Saturday’s classic sprint. Bolshunov had a commanding victory in Sunday’s 15-kilometer classic race. He stopped the clock with a winning time of 36:17.8 minutes. Early in the race, Bolshunov’s splits mirrored those of Norway’s Emil Iversen during which the two skiers’ times never deviated more than one second apart. In his final two laps, Bolshunov began to pull away from the field, putting 19.6 seconds on the second place Iversen before the finish. Sweden’s Calle Halfvarsson took the third podium spot finishing 21.2 seconds back. Iversen, who finished 9th in the World Cup standings last year said he was encouraged by his race today. “I have high expectations, I want to try to beat that result. Have to do good work all winter to do that, but good start for sure,” he said in the press conference. Last season’s overall World Cup winner, Johannes Hoesflot Klaebo, finished 9th (+47.6). Alex Harvey was the top North American skier finishing in 22nd (+1:13.9). Harvey had a strong start but slowly moved backward in the standings, which he attributes to poor early season pacing. 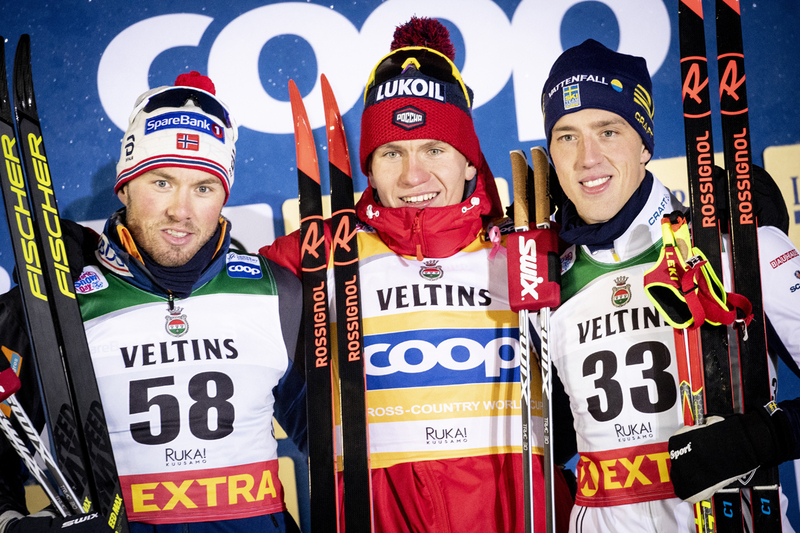 Despite a disappointing result on the day, Harvey is feeling positive about his racing in Kuusamo and is encouraged about his fitness at this point in the season. Harvey placed eighth in Saturday’s classic sprint. Also for Canada, Russell Kennedy (TEAM R.A.D.) skied to 71st (+3:47.6), Andy Shields 82nd (+4:22.6), and, Julien Locke (CNST) 83rd (+4:32.3). Leading the U.S. men, Erik Bjornsen finished 31st (+1:50.0), just outside of the points. (The top-30 on the World Cup score points.) Bjornsen raced with consistent lap splits, maintaining a position between 29th and 34th at checkpoints throughout the race. U.S. coach Matt Whitcomb was encouraged by Bjornsen’s effort. 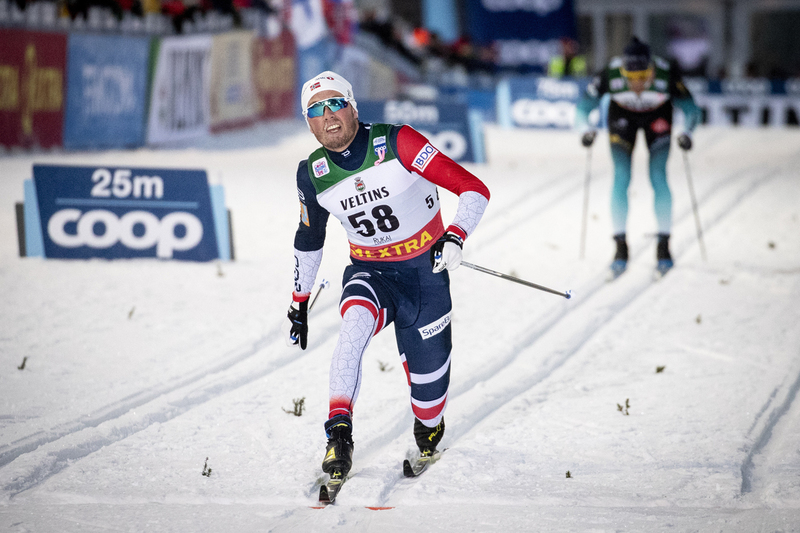 Next for American skiers was Adam Martin (CGRP) in 53rd, followed by Scott Patterson (USST) in 57th, David Norris (APU) in 59th, and Kevin Bolger (USST) in 63rd.